The restaurant boasts a beautiful corner location with abundant natural light. It was designed and built by Jack Moore of Gateway Building Company. In homage to Durham’s long tobacco history, the bar top and tables are inlaid with real tobacco leaves, artfully crafted by Artisan Leaf. With windows into the kitchen on the exterior of the building and in the dining room, passerby’s and diners alike can enjoy a rare glimpse into the heart of the restaurant. 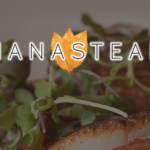 The NanaSteak family is thrilled to be a part of the New Durham movement downtown–the systematic and loving restoration of our great city one block at a time and the revitalization of culture including new shops, bars, restaurants and hotels.